Copyright � 2007 Ali O.Oncel, all rights reserved. What I did not understand is the refraction angle concept? Try to click regarding things such as refraction angle and find some linked sites which might help you. Also, read Chapter 7 of your book. Amaseis Program I tried to use it but I had a problem, I wish if give us a tutorial? I attached a guideline on the use of Amaseis Program. Hope this might help you. How to use equipment in the field? It is not clear for me which equipment you are asking me learn how to use it. Geop204 does not include any field trip of that you might have experience on the use of seismometer but Geop202 should have provided you some field experiments. I can try to arrange some supplementary field trip if you let me know what you clearly want to see more in the field, more than given in former course of Geop202? It�s a general phenomenon for mb �body wave magnitude �above about 6.2 and Ms �surface wave magnitude� above about 8.3 but this kind of change is not observed for moment-magnitude, Mw �Moment Magnitude� (pp.264, Stein and Wyssession, 2003). The beach balls were unclear why do they have that shape? What is the idea that makes Geophysicist to represent the fault in the �Beach Ball� shape? I think it makes it more difficult. You can read pages of Bullen and Bolt ,between 402-411. I did not understand the Damage Scenario; what is it? How can it be used? It is an issue for Earthquake Preparedness. For example, a damage scenario might provide a general representation of the possible damage caused by any size of earthquake magnitude. Regarding possible location of fault and expected magnitude, proposed a damage scenario might help to show a future upcoming damage which might reflect an overall economical and engineering assessment. Provided parameters are critically important to build up some organization which might regulate post-earthquake emergency management. I did not understand the focal mechanism �Compression & Dilatation�? Compression and Dilatation are the types of stress, which are estimated by polarity analysis of P-wave arrival. Any kind of faulting is resulted by stress released, which has components based either dilatational or compression. Distribution type of stress makes a representation for type of faulting which is given by solution of focal mechanism. Polarity positive (up) or negative (down) indicates the changes in regimes of stress (compression or dilatation). Hanging wall & Foot wall? Oblique faulting? These are concepts which are used the direction of fault motion. Hanging Wall is up (Thrust Fault) or down (Normal Fault). Remember that direction of slip for those faults has one component while directivity of Oblique fault has been given by two direction, which resulted by two different types of faulting occurred simultaneously. Better estimate of faulting is given by Moment Magnitude which is calculated by Seismic Moment. Inclusion of Fault Area, Shear Rigidity and slip are totally based on the area of faulting, which makes a best way of estimating magnitude. Where can an earthquake happen in Saudi Arabia? What is magnitude if it happened? Earthquake can happen anywhere through earth but generally the best way is to know historical documents of past earthquakes. Location of previous earthquakes might be cause for future location of future earthquakes. If historical data is not present for past earthquakes, earthquake monitoring is suggested to monitor the present activity of recognized tectonics fault. In summary, larger historical earthquakes together with present-day activity of microseismicity through Arabia might indicate a base to understand potential of seismic hazard, which requires more investment of deploying more instruments through Arabia. Are the nuclear researchers and big bombs testing cause earthquake and faults (rupture) in the Earth�s crust? To my sense, it might not effect since the location of nuclear testing area is out of people. Also, the depth of nuclear testing is very shallow while earthquakes of larger magnitude happened to deeper part of crust which is average in 15 km. I can say that earthquake can cause earthquake but can not say directly such kind of nuclear testing might cause an earthquake over fault. How we can protect ourselves from large earthquakes? Protection is a reflection of what you know about earthquake potential of the region you live. The better way for protection is to keep yourself far away from an active fault zone or design your building over a ground of higher shear strength. Difference between Seismic Moment and Moment Magnitude? How are they related? Moment Magnitude is simply estimated from the estimated Seismic Moment. I do not understand Location of rake? I am not agreeing with such kind of homework which we should install a program in order to do it? Locating information of rake is based on the information of positioned station. The positioned station which is rotated to equator and then rake through the azimuth is connected to center of earthquake �center of steorenet�. Point which intersected to great circle of fault plane gives node of rake. 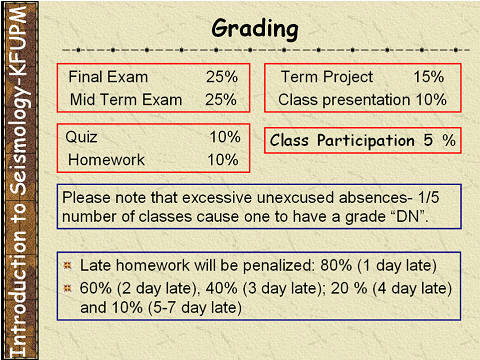 I suggest you to visit regarding slide in class handout. Thanks for sharing of your disagreement with me on the way of policy for giving homework. It is a policy of making homework, which might changes from the teaching methods. How to detect the fault plane in each situation (Normal, Reverse, Strike-Slip Fault) using Beach Balls regarding some of the given data? You can not detect fault plane for each station since fault plane is unique and based on compiled data through several seismic stations. But, you can estimate information regarding a distance between station and earthquake epicenter, which gives you take-off angle, and azimuth for station. A couple of information �distance and azimuth� is used to locate the station over the steoronet. You need to compile similar data for global stations in which you decide to use records of seismic data due to earthquake. As a result of mapping those information over the steronet together with the type of ground motion �Polarity�. See the example of Steronet which includes information of stations and type of deformation (solid=compression and circle=dilatation). In briefly, one station does provide a piece of information about polarity of ground motion but more information is required as shown in the map. In the class example, locating for station is shown to give you understanding on the proper way of pointing stations but fault plane can be performed following more information which is compiled through the global seismic stations. Can you give us websites about the strike & dip angle? You can find a paper below which is simply written for geologist to use beachball for fault interpretation but also Chapter 16 (Bullen and Bolt, 1988) includes a detail information on the way of preparing focal mechanism and some terminology. I want to ask about the focal mechanism � Beach Ball� who will be interpreted more by geologist and geophysicist? As a geophysicist, you are supposed to interpret type of faulting but also geologist can make an interpretation since no restriction on major. A fault mechanism based on first arrival of P-wave is a method of seismology and anyone can make interpretation. I did not understand how to locate azimuth & station in a steoreonet? How to find the dip and strike on that map? Outside of steorenet shows the angle which you can use for pointing azimuth while the angle from the equator gives an angular distance to locate the value of dipping angle. How to decrease the risk of Dams? It is suggested to select an area for constructing Dam which should be far away from active faults. Thus, active fault detection based on seismic monitoring is critical. Generally, big structures like Dam are projected to respond to large EQ in the region. Thus, the problem on possible seismic risk can be related to increased population around the Dam area. Strengthening old building or well-design project regarding new buildings should be suggested. Is the effect of oil extraction same as the effects of dame (active seismicity) or it cause just a sink down? We are talking the effect of man caused earthquakes and Oil extraction, which is done together by water injection, makes an effect in the regional seismicity. Thus, real-time monitoring seismicity rate might help to find optimum rate of oil-extraction which might reduce seismic hazard. Aftershocks sequences are the rate of exponentially decay. Aftershocks rate in any sequence will continuously drop as time progresses following mainshock. Please note that aftershocks are dependent events since they happen after a larger earthquakes. It shows a relation between the numbers of aftershocks occurring and passing time t after the mainshock, which will be proportional to that time t taken to the negative power of p, a constant. This means that aftershock numbers will be rapidly decreased at first, but will gradually become less severe until it levels out. It is also known as Pore Pressure which reduces the effect of normal stress and allows sliding to take place at lower shear stresses (see pp.353 of Stein and Wysession, 2003). Does the dam filling triggers EQ because of load? Or there is another reason? Main reason for triggering due to changes in the water level comes from the existence of tectonic faults in the region of Dam area. The possible effect due to water rate is about 2-3 bars which is small to trigger a normal magnitude earthquakes unless a tectonic fault in the region is present. Please remember that a stress drop for large events is observed about 30 bars which is significantly larger compare to possible effects due to water increase. Assume that 30 bars are accumulated through a tectonic fault for 100 years. Then, earthquake recurrence time will be shortened about 10 years due to triggering effect of Dam for increased rate of water. I can not understand between water level and EQ? The water level increased the size of Pore-pressure which makes decreased normal stress in the region and earthquake occurrence is accelerated. What is the relation between water column and seismicity? There is no statistical relation between rate of water and seismicity but several observation are published in seismology journals. Is there any difference other than weakness of surface waves between nuclear tests and Earthquakes? If the Nuclear test is done on the ground (surface), will it produce surface wave? Depth: Nuclear explosions have all been shallower than 2 km. Thus, a deep-seated event (say 200 km) is unlikely to be a nuclear explosion, even assuming an error of 20-30 km for depth estimate. Polarity: The first P-wave from an explosion to arrive at any seismic station, the polarity will be positive or up since radiation of seismic wave due to nuclear explosion is compressional. How can the Surface Wave (in magnitude) be smaller than P-wave in the nuclear test? It is related to differences in radiation of seismic energy as compressional (bomb) and shear. For example, earthquakes occur by shearing �slip along a fault�, generating large amount of shear wave energy, which cause a larger surface waves. But, explosions involve compressional motions which mean energy released from center to outside, then shear waves are generated in lower size. In summary, changes in size of shear waves are totally dependent upon types of released energy. It is a type of blasting based seismicity since blast is used to excavate mining and released energy cause a shaking in the region or smaller earthquakes. What are the uses of Byerlee�s Law? Byerlle�s Law? I could not understand Byerlee�s Law for Rock Friction? Byerlee�s law is based on Laboratory results for sliding on existing faults of various rock types find relation between normal stress on fault and shear stress required for sliding. Those couple of former stress is needed to infer effective stress as a function of depth. Please remember that size in effective stress in space and time is main factor effecting seismicity rate in Reservoir or Fault. Rock friction you mean Friction Coefficient �μ� is defined by a couple of above stresses (Normal and Shear), which can be inferred through the Byerlee�s law. If the oil or gas extraction done in stable plate, will it cause a falling down ground? I think that you ask induced seismicity might cause a surface fault. For surface rupture, the size for released energy should be reach a state of stress which might cause an earthquake M=6. To my best knowledge, I could not see such kind of larger event which was caused so far due to oil-extraction since maximum observed magnitude was 4.3 as observed in Ekofisk Area in Norway or British Columbia. Such magnitudes (4<M<6) are called intermediate seismicity which might not cause a ground deformation. How a seismic station works? What does Rock Burst Mean? rock bursts they are a result of seismic activities.They are generally defined as siesmic events which cause damage to underground mine workings.They are due to brittle fracturing of rock,causing it to collapse rapidly with violent expulsion of rock that is aproximately 100/200 tonnes or more this is due to the release of energy and it results in a decrease in the potential energy of the rock around the excavation.Another explanation is that the changes brought about the mine due to te redistribution of stress trigger latent seismic events that derive mainly from the strain energy produced by the geological aspects in the state of the stress. Please remember that effect of either extraction or injection might be possible cause for decreasing Effective Stress in Reservoir regardless the type of material which is extracted gas or oil, injected fresh water or waste water since Changes in Pore-Pressure makes a decrease in effecting normal stress which enlarge effective stress of region. Could you please list these 5-D parameters? How to find the frequency-magnitude statistics? Today, it is easy to make such kind of statistics under EXCELL. 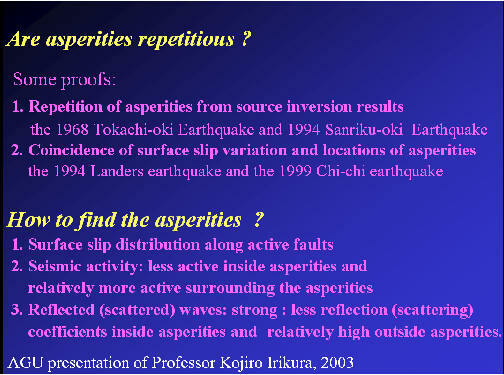 How we can find and locate asperities. I could not understand how to calculate asperity? If the region have a large asperity, is that mean there will be volcano (Turkey have a lot of earthquakes but no volcanoes)? Volcano is observed as a result of deformation through convergent zones, which indicates a rate of stressed released due to increased temperature and pressure. Volcanic seismicity is different than the tectonic seismicity but related. Thus, the depth of volcanic events is restricted to five or 10 km. It is mostly observed in Japan, that volcanic activity through conversion zones is observed near to location of tectonic earthquakes which include asperity. In the eastern part of Turkey, there are several volcanoes but there is still debate on present-day activity. Thus, we can not talk about asperity for volcanic events since volcanic events are related to fluid migration due to increased temperature and could not be related to a brittle seismic source (asperity). Why do we need the seismic history for any region of world? The one of the most important thing which is performed under PALEOSEISMOLOGY is to detect time of historical earthquakes and the location of fault. Generally, historical earthquakes leave some deposits regarding past earthquakes over the fault zone. Aging regarding left deposits provide some important information regarding year of earthquake and size of earthquakes. A knowledge regarding a couple of previous earthquakes over any fault is simply used to define recurrence interval. 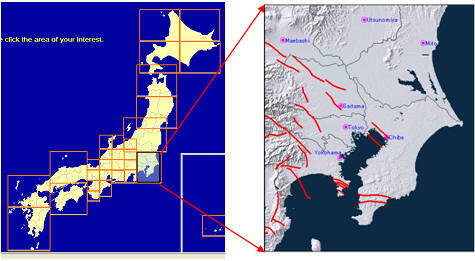 Thus, seismic data indicates earthquake potential of area and active fault detection indicates the location of historical earthquake, which means indicating location of future earthquake. How can we calculate the probability of an EQ to happen? Probability is simply inversely related to earthquake frequency. Please remember Frequency-Magnitude relation as �Log N= a � b M�. Then, you can estimate recurrence of earthquake (Period) which is inverse of N for any value of M (say M=6). Then, you can find the recurrence time (T) for M=6 from the frequency value of N(M=6). The inverse of T (1/N) might provide you a probability for per year. Threshold means a value which must be exceeded to begin for earthquake statistics. It means that you are discouraged to use values less than threshold value, because threshold value, which means minimum magnitude, indicates the value for complete data. Why is it not reliable for less than 50 EQ�s? As a result of Professor Aki�s paper (1965)*, fifty numbers for earthquake statistics is suggested to calculate more accurate b-values which have lower standard deviation. I generally use hundred events to increase the reliability of my calculation for b-value. *Aki, Keiiti, 1965, Maximum likelihood estimate of b in the formula log N=a-bM and its confidence limits: University of Tokyo, Earthquake Research Institute Bulletin, v. 43, pt. 2, p. 237-239. Are there any faults in the stable cratonic cores? Of course, there are faults in Stable Cratones. The only difference is deformation over stable craton is slow since most of Stable Cratones are aseismic. What is the (g) on PGA unit? Peak ground acceleration can be measured in g (the acceleration due to gravity) or m/s�. Peak ground acceleration is a measure of earthquake acceleration. Unlike the Richter magnitude scale, it is not a measure of the total size of the earthquake, but rather how hard the earth shakes in a given geographic area. What is the meaning of hot spots? It has been used to emphasis the areas of higher ground motion. See areas of hot spots in below figure are related to yellow areas regarding softer sediments or more ground shaking. In page 449 of Bullen and Bolt, the attenuation as a concept is discussed in detail. Simply, attenuation is a measure of ground motion between causative faults (earthquake source) and site. Is the magnitude that record in seismograph change with change in place (If it placed in soil surface or mafic surface)? 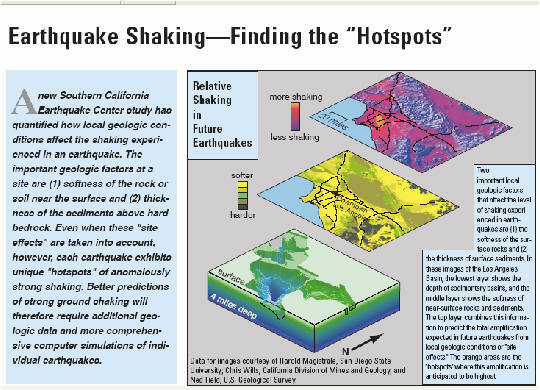 Please look at the map of ground shaking above, which indicated changes in the strength of ground which can be estimated by analysis of seismic waveform. Amplification of seismic wave might be higher in softer area while harder area might cause a seismic record of lower amplitude. In summary, ground motion is measured by changes in amplitude changes of seismic record by seismograph. Same force applied to different types of grounds (softer or harder) might cause recording a different size of seismic wave. Up to what value of probability there will be risk for an area? 0.25-0.30 g which might cause a moderate to heavy damage while more than 0.60 g might cause an extreme shaking which might cause very heavy damage. No damage is expected for range in 1.4-3.9 (% g) while 3.9-9.2 (% g) might cause a very light damage but more than % g values of 9.2 might cause areas having a potential of strong damage . Please note that expected damage is not universal since damage is controlled by strength of any building and carefully site selection. For example, a building over softer area might have a great damage. On the other hand, same type of building in harder area might have a less damage. In this case, same building over two different types of ground might have a different damage. As a result of different approached in building a city, different damage can be observed due to same size earthquake. For example, observed damage Simon Earthquake of M=6.5 (2 Death) in California is not the same with that damage in Bam earthquake of M=6.5 (30,000 Deaths). Please explain the concept of Probability of PGA? Probability estimates of PGA are based on time in year and distance. For such kind of estimation, a hazard curve is needed to show changes between probability and PGA value. How is PGA related to distance? Higher value in short distance (site and fault) is expected in PGA (g) and vice versa.